Contra Loma has a great sunfish population including Bluegill and Redear Sunfish. These fish can usually be found in the shallower and more vegetated coves and along the dam face. We would recommend using small lures or worms if you are targeting the sunfish. Trout fishing has been slower the last couple of weeks. We will receive a trout plant the week of February 4th. We recommend fishing with Powerbait, lures, or nightcrawlers for the trout. Try fishing at the boat ramp area, or the Channel Point dock areas. Catfishing has slowed down now that they are no longer being stocked. Try fishing for catfish at Channel Point or Loma Island with anchovies, nightcrawlers or chicken livers. Boaters would do well toward the middle of the reservoir or along the dam. 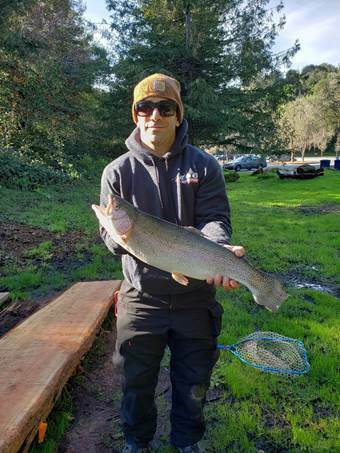 The black bass population at Contra Loma is thriving with lots of large bass in the lake! They will bite at artificial lures and baits, and they tend to chase the stocked trout, so a good swimming lure that resembles a trout should help you hook into some of the bass in the lake.